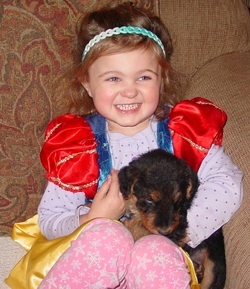 AKC Rock Ranch Stellar Della (Della) was born in 2009. Her exhuberance for life is evident in all that she does. She gives 110% to every task! She is Bold, Confidant and Elegant. She is the Sweetest and most loving dog, sitting on your feet to be sure you know she would like your affection. Della is a striking mover. Her full brother Turk is a point, flush and retrieve dog. Both Della and Turk are very balanced, with beautiful conformation and expression. Della weighs 53 lbs. and measures 23.5" at the shoulder. 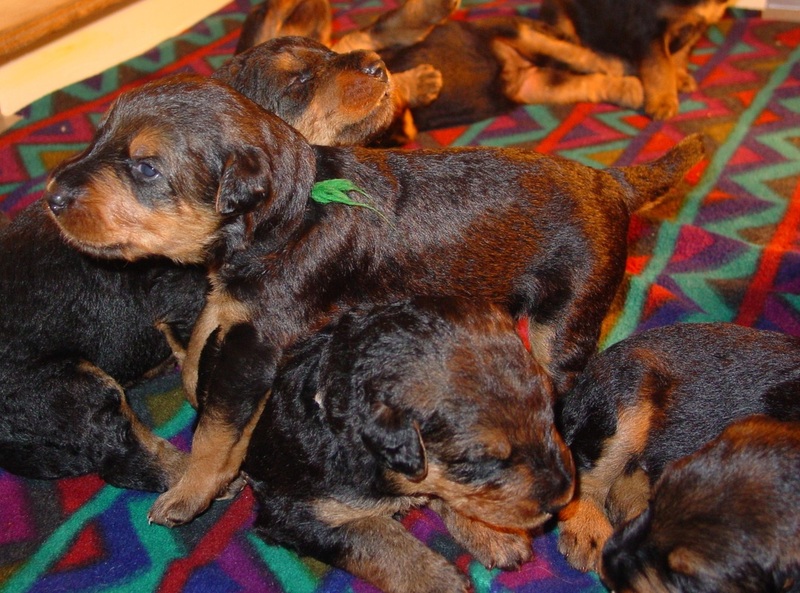 Her sire is AKC Lawrence's O'Danny Boy (Danny) by AKC Lawrence's General Sherman (Sherman). 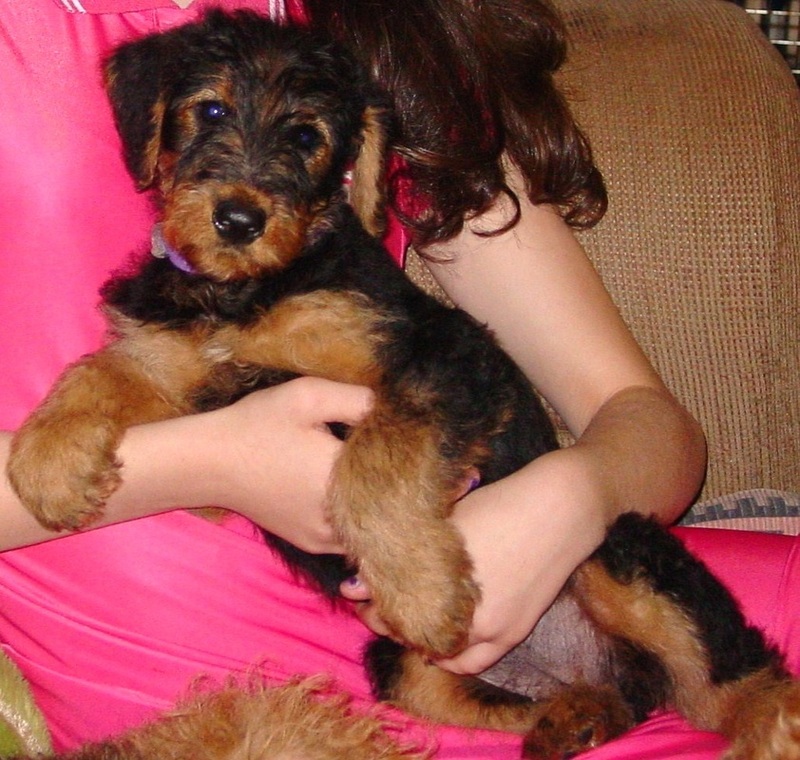 AKC Lawrence's Shadowfax (Shadow) was born in 2009. He is owned by Robyn Lawrence. International CH Stargus Galileo of Holland. Shadow is out of Lawrence's Sweet Treat (Cupcake). Shadow weighs 65 lbs. and stands 24.5" at the shoulder. He has a charming personality, correct conformation and is MOST FRIENDLY! 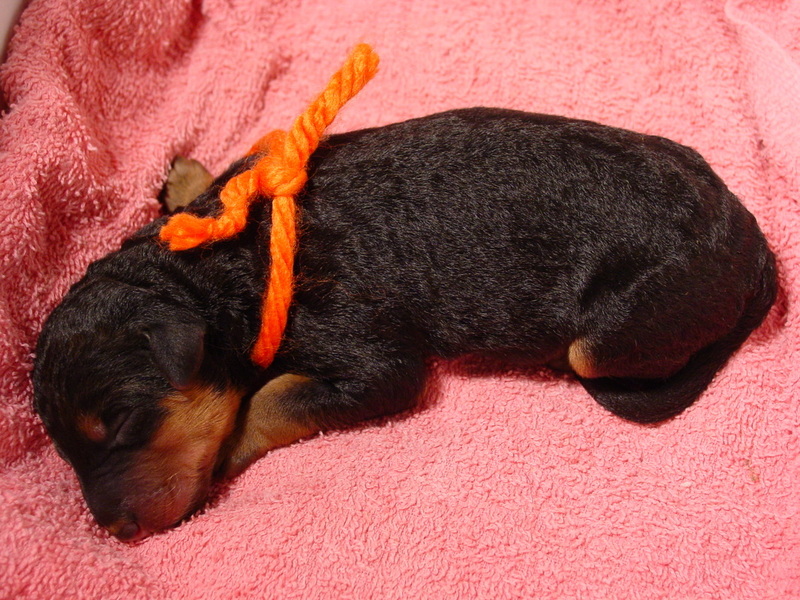 CH REYDALETERRYDALE DAREDEVIL (Collin) is Shadow's Father. He is out of CH Reydaleterrydale Return To Me and by Int'l CH Stargus Galileo. Collin is bred by Gerardo Reyes of Apex, NC. 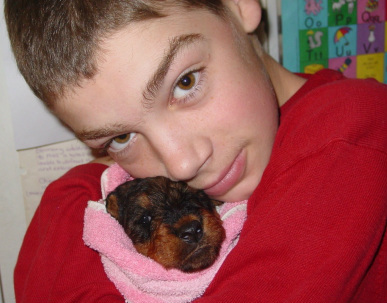 Reydaleterrydale Kennel is dedicated to producing a competitive show dog consistent with the breed standards of excellence and one we can enjoy as a companion. 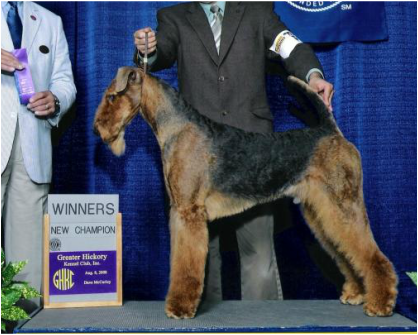 Since 1984 their dogs have been awarded several titles, always as an owner/breeder/handler (Mexico, Int'l, Americas, Latin American, American and World Championships). South Africa, Mexico and Costa Rica. Reydaleterrydale Kennel has a goal to produce nice dogs with excellent temperament, great attitudes and movement. Int'l CH Stargus Galileo is Collin's father, and Shadow's grandfather. Luxembourg and Netherlands Bundeseiger CHAMPIONSHIPS. 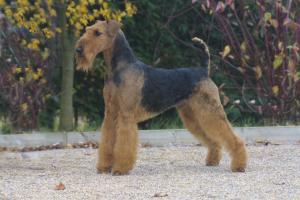 He has won Best in Shows, Groups and Best of Breeds in the UK, Europe and USA. Sire of champions and winning progeny worldwide. 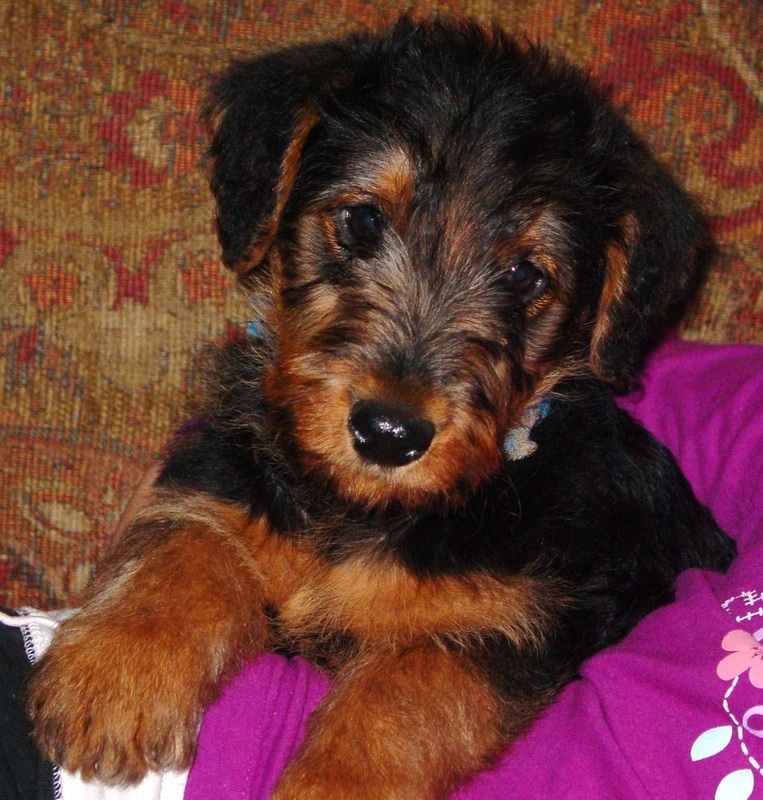 Our Sept. 2011 Litter's Great Granddad. Della and Shadow are proud parents! Litter of 8 healthy pups... average 15 ounces each. Look at them shine! 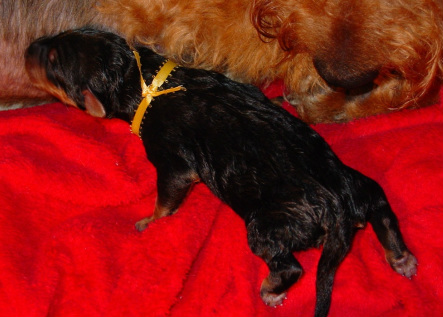 3 days old... Tail's UP! It's hard to believe two weeks have flown by! The pups are all over 2 lbs now. They gain rapidly at this point, approximately one pound per week! All the puppies are progressing to walking and climbing (mostly each other). Their eyes are open when they are awake. Thrilling to say the least. Watching the pups begin to interact and play is amazing! All pups weigh in at over 3 lbs. We are starting to allow family members to handle the pups in a safe way, to acustom them to future family life. 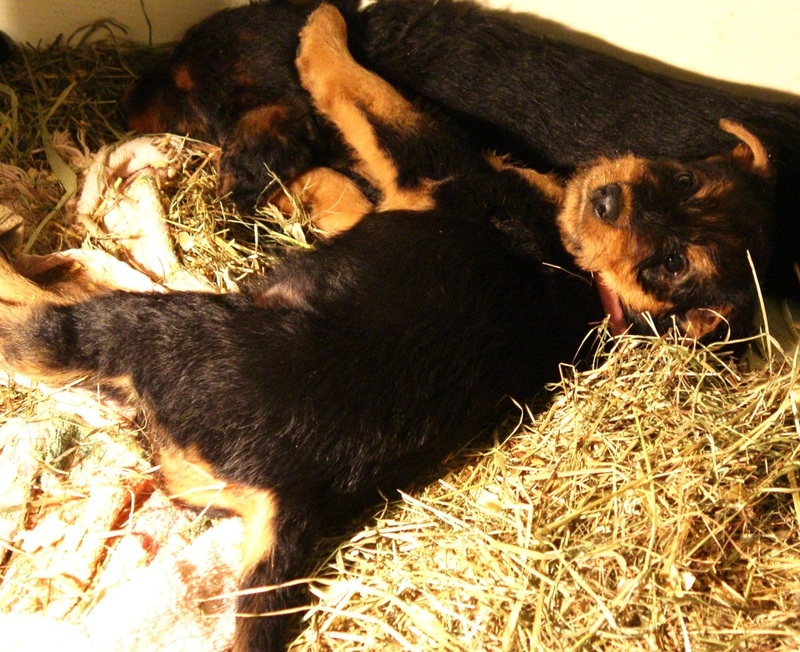 The pups are on a de-worming program as is their Mom. They are getting their teeth in! BIG CHANGES is all I can say. The Puppies at 4 weeks are beginning to have more individual features. They are showing individual personalities too! 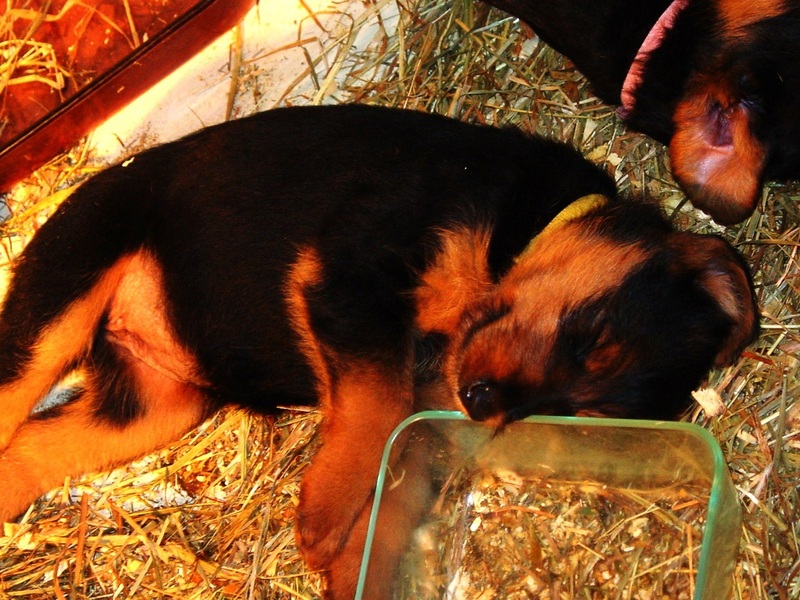 They romp and play hard, eat their "puppy mush" energetically, and sleep soundly. Their diet consists of Taste of the Wild 32% protein kibble (ground) (no wheat, no grain, no soy) with cooked sweet potatoes, fresh goat milk, raw hamburger and probiotics. The pups SEEK out people, they want to be with us more than anything. They hang out with us while we cook dinner, read, and watch TV with us! They are the main attraction for all who visit. We love puppy socialization! Five week old puppies are a BLAST to watch. They are playful most of the time. The pups are trying new things, they have 'toys' and obstacles to manuever in their play area. They play hard, eat and then C-R-A-S-H ! Six Weeks is HUGE! The pups are growing quickly at this stage. They play energetically, as they via for their rank in the family. 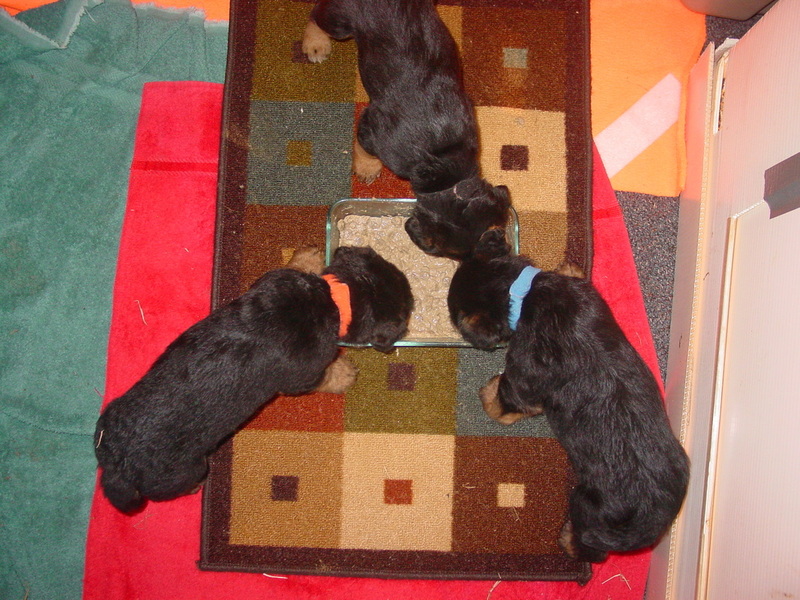 They are already potty training in the playpen area with linoleum flooring, and so smart! They hop the wall back into the hay area to go when they feel the urge. AWWWW! TOO CUTE! SO ADORABLE! That's what we hear constantly when folks are visiting us. 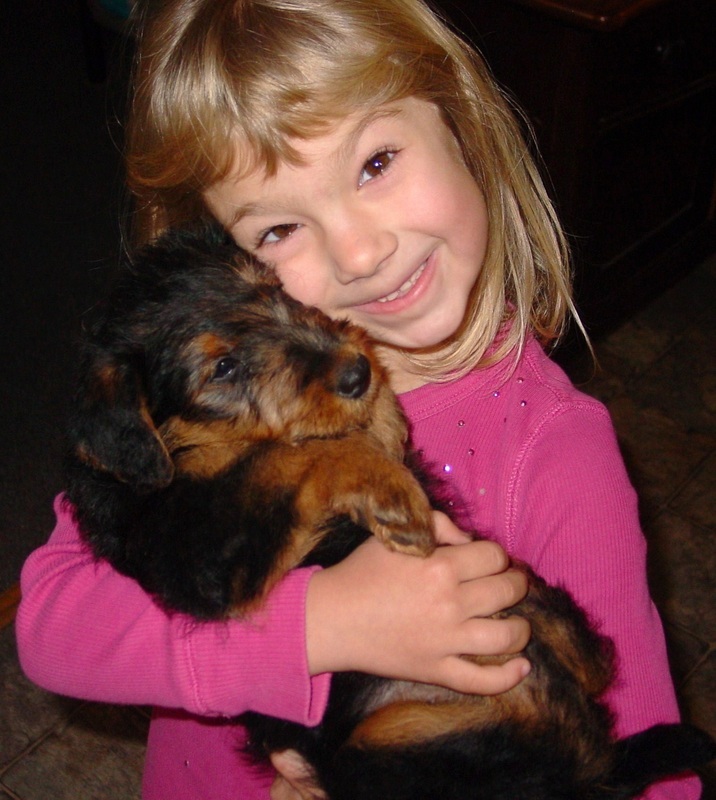 The kids are all about interacting with the beautiful and bouncy puppies! The pups are SO tollerant! The Young ones are adopting their own personality and style now, some are more laid back, some more energetic, but all are Athletic, Friendly and Fun! 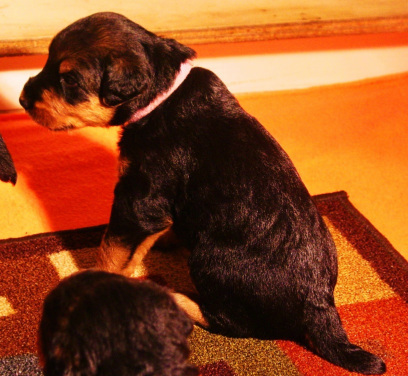 We have evaluated the pups for Tempermant and Sociability with Puppy Aptitude Testing. I am happy to report they all passed with flying colors! This litter is very consistent. The tests will help us immensely when assisting new puppy owners in selecting their puppy. Unbelievable. The last 8 weeks are a blur of fun and fur. We can't believe it is time to say so long, these puppies feel like our family. It is bitter-sweet, as we see the excited faces of our new puppy clients comming in the door. At first it feels like we are decreasing, but we are extending our family for sure. 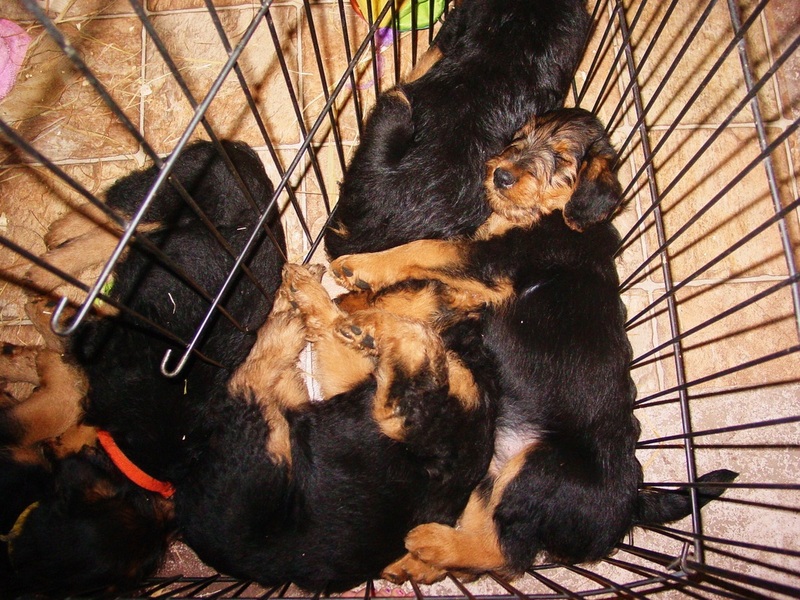 (above) Puppies clamour to get out to their new homes! (right) Caleb does his school work in the Puppy Playpen. Della (Momma) drying after her bath yesterday. She is fit as a fiddle, playful with the pups and teaching them how to interact correctly. She has been an awesome Momma! Lord willing she'll be having a litter in 2012.
feel free to call if you have an interest in reserving your pup for 2012.